Take a look at this family home bursting with character and space, perfectly positioned for the commuter with great access to both Chatham and Rochester rail stations with a high speed rail link to London, great choice of well regarded primary and secondary schools. This three bedroom family home is well presented throughout and can be moved into without the worry of having to spend a penny, all that would be required is for you to simply place the furniture! The separate living and dining room is a major benefit when having family and friends over as there is more than enough space to entertain without feeling you are lacking space. With the kitchen opening up into two areas, the amount of cupboard space is ideal for storing away the every day kitchen utensils. 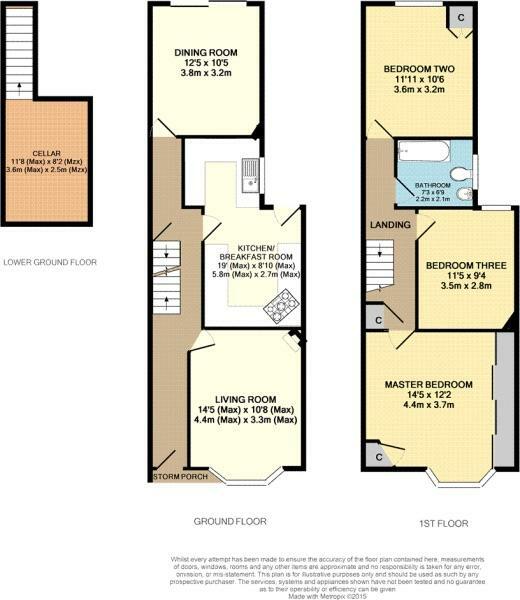 The three bedrooms are all a great size with the main bedroom having a fitted full length wardrobe. During the summer months the garden is a delight. There is more than enough space for the children to play whilst you can relax in the sun with a good book. It is designed for entertaining with power and lighting available within the garden. This place is absolutely perfect for a growing family and is situated conveniently for access to schools and commuting to work. There is an abundance of local primary and secondary schools all within easy reach. For those who commute, Rochester and Chatham railway stations are minutes away and you can use the high speed rail link to London. We have loved living in this house because of the space it provides us as a family, our friendly neighbours and it’s location. We love the mix of original features and contemporary styles within the kitchen and bathroom. Our recently installed slide and glide doors to the back of the house has been a great addition, allowing us to open up the dining room to the decked area of the garden, providing us with one large open space to be together as a family in the warmer evenings or socialising with friends & family. We have found the house to be perfectly positioned for a quick commute into London for work but also to access the A2/M20. We will be sad to move on from this much loved family home. Athelstan Road is within close proximity to many schools, for example, the highly regarded Fort Pitt Grammar school and Chatham Grammar school for Girls, are located within a mile. Rochester Grammar school and St Joseph Willamson's Mathematical school are both under two miles away; both are rated as Outstanding by Ofsted. Entrance door, tiled flooring, stairs leading to the first floor landing and stairs leading down to the cellar. Bay window to front, feature fire place. Window to side, door to rear, range of matching wall and base units with inset sink, drainer, breakfast bar, range gas oven/hob/grill, overhead extractor fan, integral fridge freezer, space for washing machine and dishwasher and tiled flooring. Ceramic tiled flooring, radiator, decorative fire place surround and newly installed slide & glide doors leading to the rear garden. Bay window to front, full length fitted mirror fronted sliding wardrobes, storage cupboard. Window to rear, fitted storage cupboard. Window to side, Bathroom suite comprising; Panel enclosed bath with overhead shower, wash hand basin, low level flush W.C. The south facing rear garden consists of a decked area, lawn, a surround of shingle/shrubs, side access and outside power sockets. Power, lighting & heating with window to back wall. Disclaimer - Property reference 647421-1. The information displayed about this property comprises a property advertisement. Rightmove.co.uk makes no warranty as to the accuracy or completeness of the advertisement or any linked or associated information, and Rightmove has no control over the content. This property advertisement does not constitute property particulars. The information is provided and maintained by Purplebricks, covering Meridian. Please contact the selling agent or developer directly to obtain any information which may be available under the terms of The Energy Performance of Buildings (Certificates and Inspections) (England and Wales) Regulations 2007 or the Home Report if in relation to a residential property in Scotland.